WHAT: When anti-technology extremists assassinate Dr. Will Caster (Johnny Depp) – a renowned scientist in the field of artificial intelligence – as part of a series of synchronized attacks, his wife Evelyn (Rebecca Hall) uploads his consciousness to a supercomputer. But once Will achieves transcendence, he proves to be far more dangerous than those trying to stop him. WHY: It’s difficult to pinpoint where “Transcendence” went so horribly wrong, because it’s a colossal mess of a movie that is neither entertaining nor inspires the kind of thought-provoking discussion that it likely intended. Though Jack Paglen’s screenplay topped the 2012 edition of the Black List (an annual survey of the best unproduced scripts in Hollywood), whatever made people so excited about it must have been lost in translation. That blames mostly falls on Wally Pfister, who doesn’t seem to have a very good grasp on what to do with Paglen’s sophisticated premise. Pfister may be one of the best cinematographers in the game, but he probably should have chosen something a little less ambitious for his directorial debut, because he bit off more than he could chew with this high-concept techno-thriller, which moves like molasses and isn’t terribly engaging. Maybe he thought that assembling an impressive ensemble cast would be enough to hide the film’s narrative flaws, but the performances are just as poor, especially Johnny Depp, who phones in his performance as the ghost in the machine. 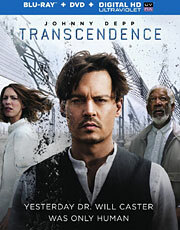 “Transcendence” certainly had the makings of an excellent cerebral thriller, but instead, it will only give you a headache thinking about all the wasted potential. EXTRAS: The Blu-ray release includes a quartet of mini-featurettes on things like Wally Pfister’s creative process and the potential of artificial intelligence, as well as some viral videos from the film’s marketing campaign. WHAT: An elite DEA task force steals $10 million during a drug raid on a cartel safe house, but when they go back to retrieve the hidden money, they discover that it’s missing. As members of the team start to get picked off in brutal fashion, their leader John “Breacher” Wharton (Arnold Schwarzenegger) joins up with a homicide detective to track down the people responsible, with the surviving agents suspecting it could be someone from within their own ranks. WHY: Arnold Schwarzenegger has been hard at work since his return from retirement, but he’s still yet to make a film that measures up to his more iconic roles. “Sabotage” certainly had the potential to be that movie, but this modern-day twist on Agatha Christie’s “Ten Little Indians” is just another disappointing genre flick. 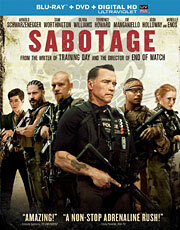 More of a slow-burning crime thriller than the action-packed film the trailers suggested, “Sabotage” represents an interesting change of pace for Schwarzenegger. This is the most subdued that the actor has ever been, but he’s just not as entertaining without his larger-than-life charisma to fall back on, with his co-stars constantly upstaging him. In fact, the movie’s best moments come from the frat-like camaraderie between the task force members, so when they start dropping like flies, so does the enthusiasm earned from the high-octane set piece that opens the film, eventually devolving into a dull whodunit. The route that David Ayer and Skip Woods’ script takes wouldn’t feel so anticlimactic if it weren’t lacking so badly in any sort of tension, because there’s nothing about “Sabotage” that’s even remotely surprising, except perhaps for the fact that a movie with such a cool premise and awesome cast could be this boring. 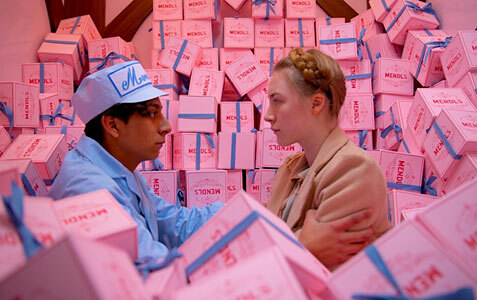 EXTRAS: There’s a short making-of featurette, a pair of alternate endings and some deleted scenes. Arnold Schwarzenegger hasn’t wasted any time since announcing his return from retirement, cranking out movies with the prolificacy of someone who knows that the clock is ticking on his Hollywood career. But despite recent appearances in “The Expendables 2,” “The Last Stand” and “Escape Plan,” Schwarzenegger has yet to make a film that measures up to some of his more iconic roles. 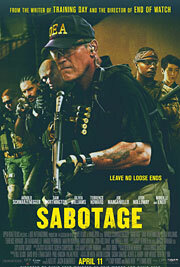 The actor’s latest project, “Sabotage,” certainly had the promise to be that movie. Directed by David Ayer, who’s pretty much become Hollywood’s go-to guy for gritty cop films, this modern-day twist on Agatha Christie’s “Ten Little Indians” shares the same basic premise used for one of Schwarzenegger’s biggest hits, “Predator.” It also boasts one hell of an ensemble cast for a seemingly generic action thriller, which is why it’s so disappointing that that’s exactly what “Sabotage” turned out to be. Schwarzenegger stars as John “Breacher” Wharton, the head of an elite DEA task force that’s taken down some of the biggest drug lords in the world. His team is comprised of some colorful characters – each with their own silly codename like Monster (Sam Worthington), Grinder (Joe Manganiello) and Sugar (Terrence Howard) – but they’re the best at what they do, oozing with so much confidence that they manage to steal $10 million during their latest raid on a Mexican cartel safe house. When they go back to retrieve the hidden money, however, they discover that it’s missing, replaced by a single, ominous bullet. Before long, members of Breacher’s team start to get picked off one by one, with homicide detective Caroline Brentwood (Olivia Williams) assigned to track down those responsible. But while the brutal murders appear to be the work of the cartel, the surviving agents begin to suspect that someone from within their own ranks is hunting them.